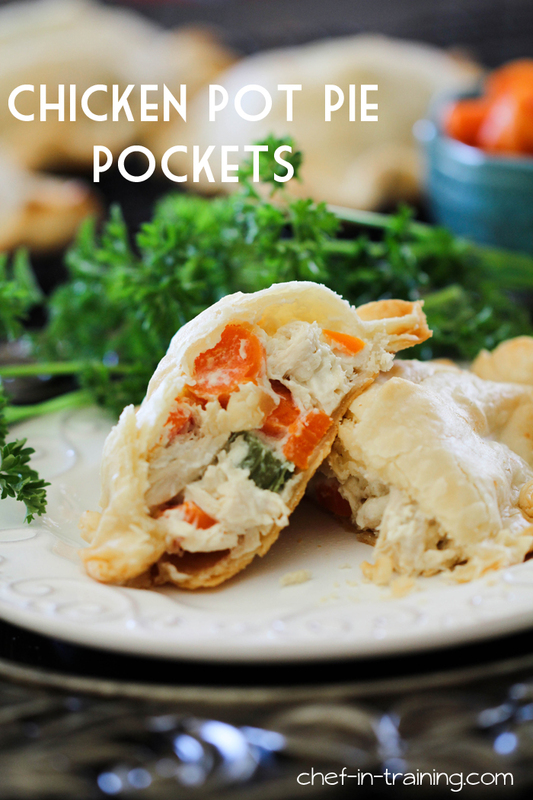 The pie pockets are back…This time Chicken Pot Pie Style. You have probably seen the BBQ Beef Pie Pockets and the Creamy Chicken Broccoli Pie Pockets by now… and they are both equally delicious! A few weeks ago, it dawned on me that I needed to add another recipe to the collection. Chicken Pot Pie is wonderful, in fact, it’s one of my absolute favorite comfort foods. However, I love the idea of being able to freeze personal size pie pockets and pull them out on an as-needed basis. In college, I remember living the single life and not getting to enjoy as many of my favorite dinners as I would like purely because it would mostly go to waste. Cooking for one, even two, can be difficult. Since these pockets are freezable, you can cook for one or two and have another dinner ready to go when needed. You could also cook all of these up at one time and serve for a yummy, personal-sized dinner for your whole family. This is one way I am able to get my kids to eat some veggies. Although, who wouldn’t love veggies though that are covered in creamy goodness?! You definitely need to make these sometime soon! An easy and delicious personalized dinner the whole family will love! Also a great freezer meal to pull out on an as-needed basis! 1½ cups cooked and shredded chicken, I usually buy a rotisserie chicken and shred it up. Add chicken, potatoes, carrots and celery to cream cheese mixture. Stir until well combined. FOR WHITE SAUCE: Melt butter in saucepan, add flour and stir to combine to form a roux. Once you have your roux, add half and half (or milk) and stir constantly until sauce thickens. Remove from heat and stir in Garlic salt and onion powder until well combined. I remember eating frozen chicken pot pies when I was a kid. Those small single serving ones, what was my mother thinking! LoL! These look great and I imagine are delicious! These look so good YUM! These look so good! I can't wait to try this recipe out. I'm always trying to find recipes that will remind my husband of home, since he's from Northern England. He saw this photo and exclaimed, "Pasties!" We're definitely trying this. So beautiful and cute. I love chicken pot pie and these would make for an easy picnic lunch! I was seriously thinking of making a chicken pot pie pocket too. Your version sounds fabulous! We LOVE pot pie. I'm going to have to try these. Looks delicious! What a fun way to eat comfort food! OMG. I love your pie pockets!!!!!! This is my favorite version yet! Will you bring it over to my Sunday Funday Linky Party?? 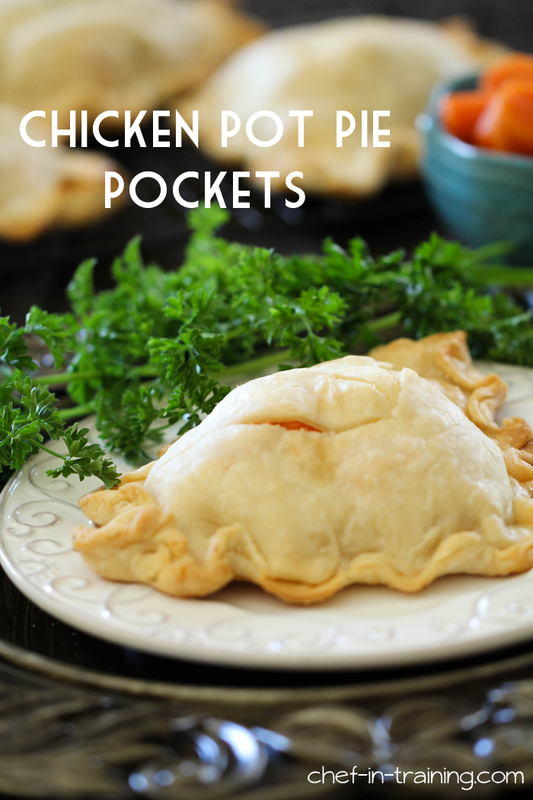 One of my hubby's favorite meals is a homemade chicken pot pie I make - so I'm loving this pocket version! I'm definitely making these for him soon - thanks for sharing! I'm so glad you posted this recipe! I have been thinking of making these for the kids for some time now, but wasn't quite sure of the 'creamy goodness' part. Hello.??? Cream cheese??? Genius! I just discovered your blog! Those pockets look delish. I need to try these! I made these tonight with a few tweaks: used fresh garlic, 1/2 large onion, 3 carrots, 3 stalks celery, 3 red potatoes, and 2/3 pound chicken breast; all finely diced and sauteed together in the butter, some salt, pepper, and dried thyme. Added Neuchfel cheese (instead of cream) after done cooking; stirred until melted. This quantity filled 4 pie crusts (homemade with half white and half wheat flour), each cut to 3 hand pies a piece. Turned out nicely, all the kids ate it. Thanks! What can be used instead of Cream Cheese, I have an allergy to it but no other milk or cheese products? is there any way to use a gravy inside this? or should I just pour some over the top? The recipe won't show up. Could someone please post. Thanks a bunch. So sorry about that! It should be there now :) Thanks!